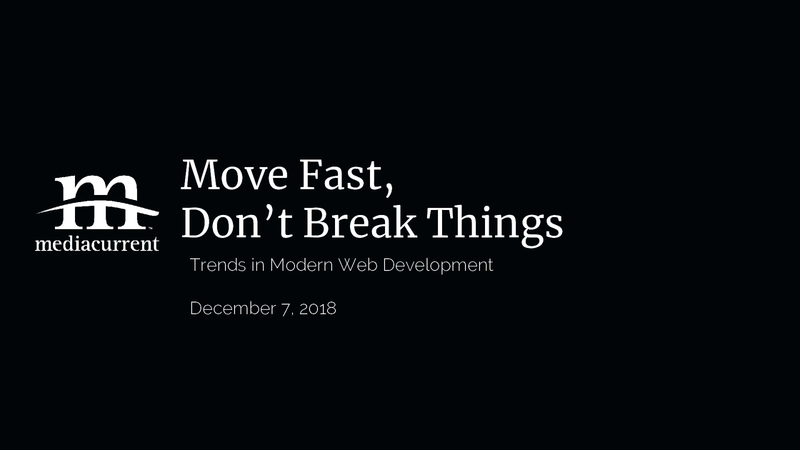 View Move Fast, Don't Break Things: Trends in Modern Web Development on Notist. Wouldn't that be great? It's the magical formula for developer, project manager and client happiness. And while hitting all these things 100% may be a pipe dream, I think new development practices enabled by technology like Gatsby and others can really help get us closer to this pipe dream. First I'll just give a little background on me, who I am, the kind of work I do, etc. Then I want to go over the ways working with content management systems on the front end has changed for me over the past few years. I'll share a case study from a decoupled Drupal and Gatsby project we took on earlier this year and our experience from that. And based on that experience, I want to discuss the different ways decoupling can change things at an organization, including the development process, but even beyond into hiring and client diversity.